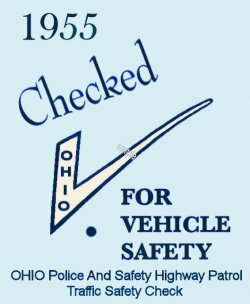 1955 Ohio Safety check sticker - $20.00 : Bob Hoyts Classic Inspection Stickers, Add a Final Touch to your Restoration! Ohio had a inspections as far back as 1937. Whenever a vehicle is pulled over in a roadside check and is approved it will receive an inspection sticker. This practice continues to this day.. This 1955 Ohio sticker was carefully restored both front and back from a very nice original.